Bodie Reading (WRX) currently leads the Tasmanian Rally Championship. Photo: Angryman Photography. 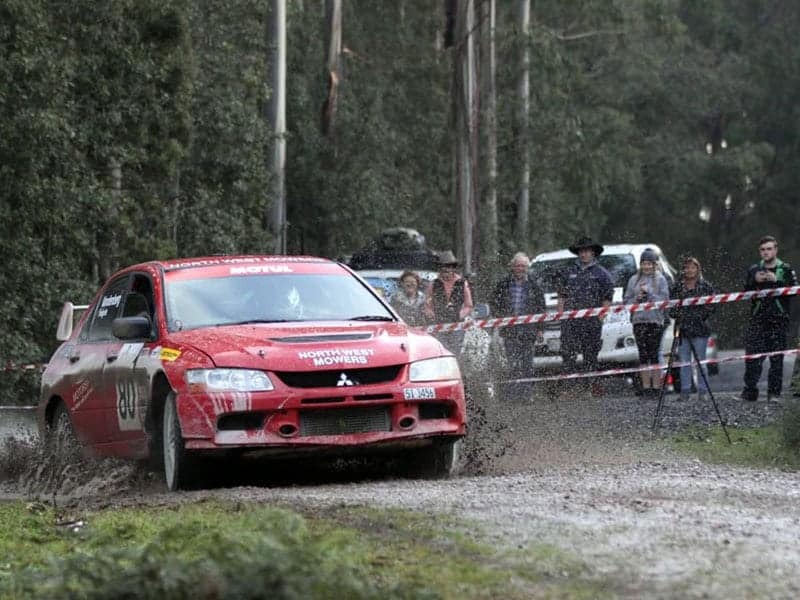 The Tall Timbers Hellyer Rally will be one of the most fiercely contested in years this weekend, with a quality field assembling to tackle the smooth forest roads west of Smithton in Tasmania. Teams will contest eight competitive stages and 140 kilometres of roads in the Dunlop-Motul Tasmanian Rally Championship’s second event in 2018. Championship leaders Bodie Reading and Alex Malcolm will start as the favourite in his Subaru Impreza after winning the first round in fine fashion, however, they will need to re-adjust to this blind-rally, with their last road book event being the Hellyer Rally last year. Chasing Reading is a field of strong challengers. Tim Auty will be looking to put his round one mechanical gremlins behind him and again challenge Reading for the win in his Mazda 323 GTR. Former champions Jamie Vandenberg (Mitsubishi Evo 9) and Keith Abblitt (Mitsubishi Evo 8) will also be in contention for the win, as will young duo Kurt Wylie (Subaru Impreza) and Steve Maguire (Mitsubishi Evo 5). In the Buckby Subaru Challenge, all eyes will be on the enthralling duel between Ben Newman and Nic Grave. Newman won the Southern Safari Rally by a very small margin, however, Grave is competing in home territory and will be hard to beat. Targa Tasmania podium finisher, Mike Pritchard, is a welcome return to the series for this round, and produced strong results in his previous event, whilst Crichton Lewis will be looking to avenge his DNF from round one. Stephen Turner currently leads the two-wheel drive class in his Ford Fiesta R2 after a strong showing in round one, however, he will have a number of strong challengers for the class win. Fresh from a podium finish at the Alpine Rally of East Gippsland, Kade Barrett will enter his rare Plymouth Fire Arrow and should be hard to beat. Entries from Aidan Peterson (Daihatsu Charade), Mark Kyle (Datsun 1600) and Bill Cromarty (Mitsubishi Lancer) further enhance a quality two-wheel drive field.